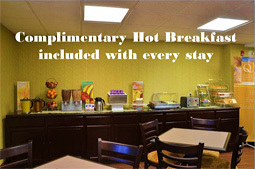 The Quality Inn and Suites is the perfect destination for business and leisure travelers visiting the many business, educational, entertainment and recreation venues of central Massachusetts. Offering easy access to the DCU Center, UMASS Medical Center, government and military installations, and downtown cultural attractions, the Quality Inn and Suites, Worcester is the ideal choice for all your business or leisure travel needs. Choose from our comfortable hotel rooms or spacious well furnished suites with full size kitchens and appliances, and then let our enthusiastic and knowledgeable staff ensure your comfort. We are serious about starting your day right so we offer freshly cooked eggs and sausage links, selection of fruit, yogurt and cereal, pastries, and an assortment of juice, tea and coffee. © Quality Inn and Suites Worcester MA. All Rights Reserved.